Ultimate Editor is a Java based program designed by DCER. UE will edit most values within Birth of the Federation. 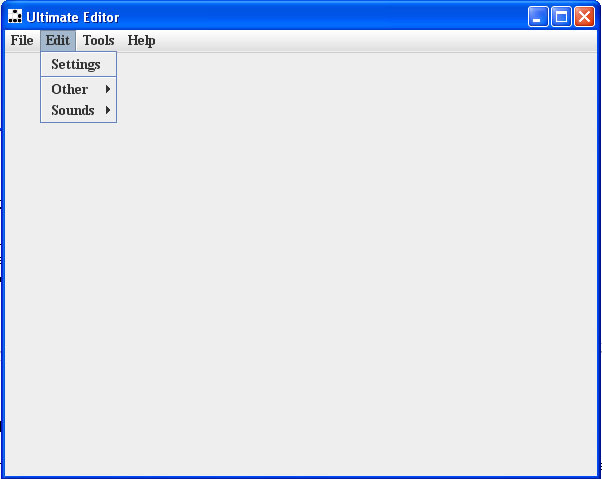 This will be a basic tutorial to explain what file UE will edit and how to navigate though the program. After You have Java installed and up to date you can get started. Note; "UE.jar" may be shown as "UE" if system is set to not show known file extensions. Double click on UE.jar to open UE interface. Once open select file tab and then open. select stbof.res and open. You now have an open file (stbof.res) in UE ready to edit. With UE still open select edit tab and settings. The next 2 areas are set by default to this location. 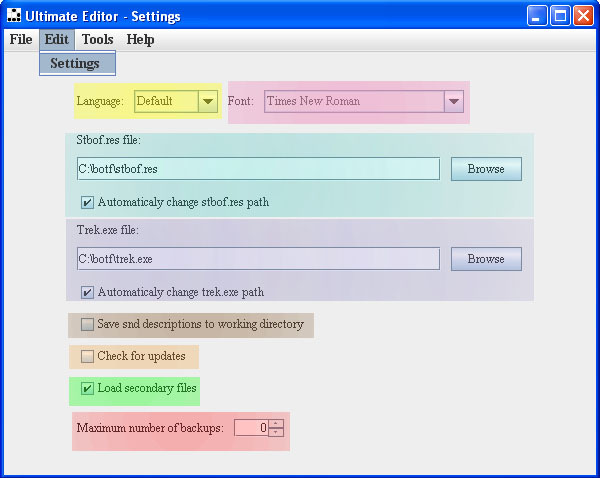 If a mod is loaded (stbof.res or trek.exe) the mod path will auto set to new path of mod files. You should never need to set this but if problem arise should be checked to see if paths matches and are correct. Select "Save snd (sound) descriptions to working directory" if you want a text file of sound description when files are edited and saved. Select "Check for Updates" if you want UE to check for if UE has been updated. Keep "Load secondary files" always checked. If uncheck, needed changes will not be made and game will be unstable. "Maximum number of backups" this can be your best friend select the number of backups you want to have. Just a warning each backup can be up to 100mb or more. Open stbof.res with UE as shown before. This section will cover the "Edit" tab with stbof.res loaded. And a brief description of most common uses for sub-categories. Most of the files that are compressed inside the stbof.res are images that are displayed during game play. Other file in stbof.res control ships used, text, buildings, and many more. So this is main file edited while modding BOTF. Edits colony values for all major races. Edits Major empire tolerance for all major races. Edits minor races attitudes toward each major races, if ships move on map, minor race personalities. 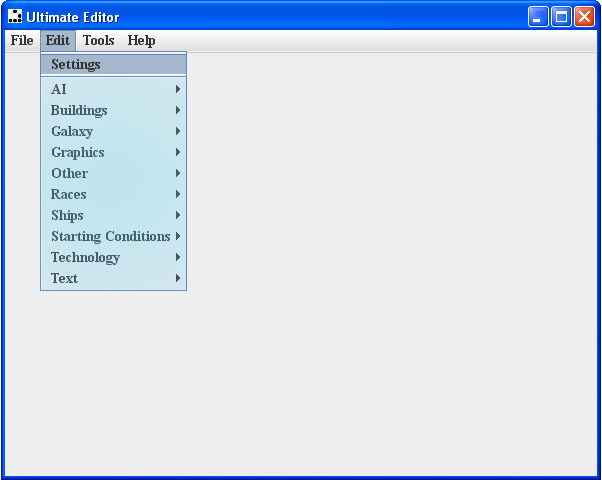 this will allow you to create a html document with stats of building in game. Edit groups of building by using formula by bonus, cost, race, ect. Edit planets names, types, bonuses, atmosphere, size, animation. Edit texture used by hob file, combat/placement of model. 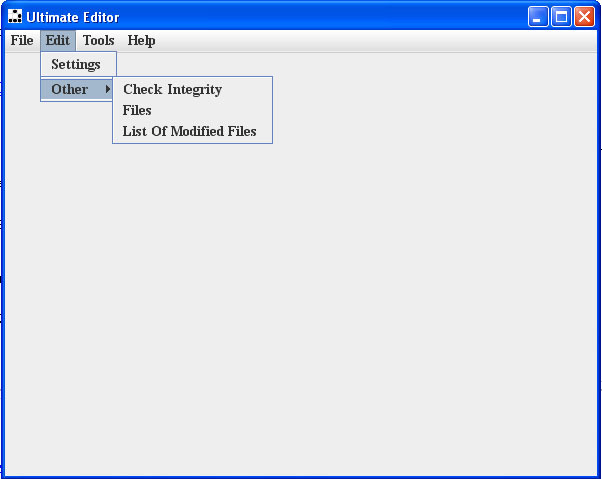 This will allow extraction of file UE has edited and or any file you have added to to list of modified files. Add file names to list when file are edited manually. 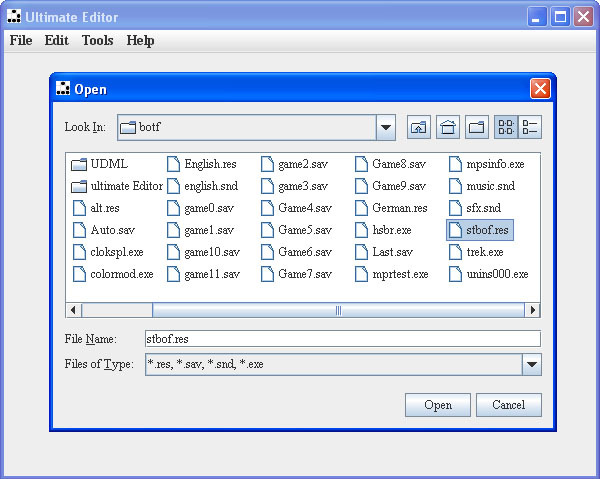 extract all edited files, extract single edited file. Edit home system Owners, systems used, and if planets are terraformed/colonized. Allows setting of starting building for each tech start for all races and amounts of each building or orbitals. Open trek.exe with UE as shown before. This section will cover the "Edit" tab with trek.exe loaded. And a brief description of most common uses for sub-categories. The trek.exe is the executable that runs botf. There are many things that can be hex edited. But here is a few things UE can do. Used to edit galaxy size and shape when games are started. major code modification allows building minor ships only if minor is a member. Used to edit credit given at start of games and starting population for all tech starts. Open alt.res with UE as shown before. This section will cover the "Edit" tab with alt.res loaded. And a brief description of most common uses for sub-categories. List of file user has changed or added to alt res. Open english/german.snd with UE as shown before. This section will cover the "Edit" tab with english/german.snd loaded. And a brief description of most common uses for sub-categories. Open music.snd or sfx.snd with UE as shown before. This section will cover the "Edit" tab with music.snd or sfx.snd loaded. And a brief description of most common uses for sub-categories. both files are edited with same type of interface. 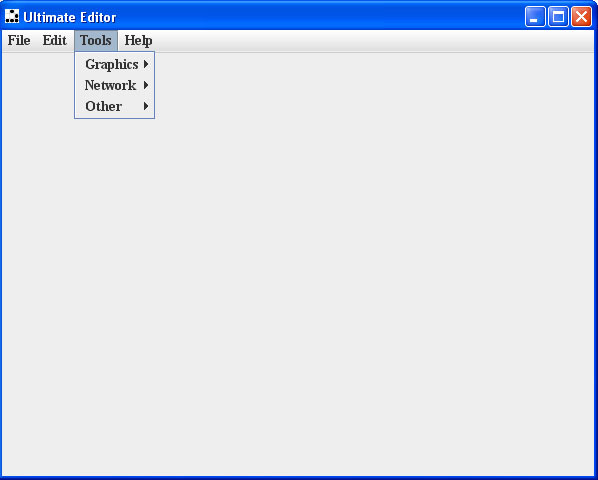 The tool tab has many useful tool you may use while editing with a hex editor or to calculate values for map generation among other uses. The help tab can give information on UE, Page help when available and general help.